Fantastic weather is forecast Friday right on through the weekend with cool mornings and pleasantly warm, sunny afternoons. Increasing humidity levels are expected early next week with scattered showers and thunderstorms by Wednesday and Thursday. 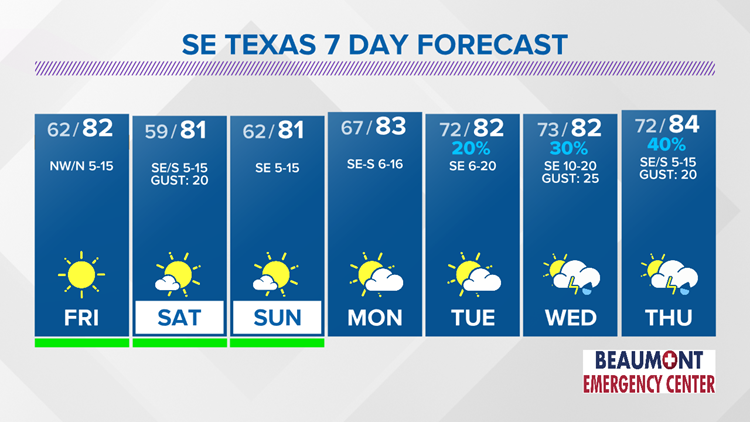 Abundant sunshine, cool mornings and pleasantly warm afternoons are forecast across SE Texas Friday through the weekend. Low temperatures will be in the upper 50’s to lower 60’s with highs in the upper 70’s to lower 80’s with low humidity. South and southeasterly winds off the gulf will increase humidity levels and cloudiness by early next week. Scattered showers and thunderstorms return to the forecast by Wednesday and Thursday. Triangle Tonight: Clearing, cooler. Low near 62° in Beaumont, 61° Orange and 63° at Port Arthur. Winds: Northwest becoming North 2-10 mph. Lakes Area Tonight: Clearing, cooler. Low near: 61°. Winds: Northwest becoming North 2-7 mph. Triangle Friday: Sunny, warm and dry. High near: 82° in Beaumont, near 80° in Orange and near 83° in Port Arthur. Winds: North 5-15 mph. Lakes Area Friday: Sunny, warm and dry. High near: 80°. Winds: North 3-12 mph. Saturday (4/27): Mostly sunny, warm and dry. Low near: 59°. High near: 81°. Winds: Southeast becoming South 5-15 mph with gusts to 20 mph. Sunday (4/28): Mostly sunny to partly cloudy, warm and dry. Low near: 62°. High near: 81°. Winds: Southeast 5-15 mph. Monday (4/29): Morning cloudiness, becoming partly cloudy, warm and breezy during the afternoon. Low near: 67°. High near: 83°. Winds: Southeast becoming South 6-16 mph. Tuesday (4/30): Morning cloudiness, becoming partly cloudy, warm, humid and breezy with a 20% coverage of showers during the afternoon. Low near: 72°. High near: 83°. Winds: Southeast 6-15 mph with gusts to 20 mph. Wednesday (5/1): Morning cloudiness becoming partly sunny, warm, humid and windy with a 30% coverage of afternoon/evening showers and thunderstorms. Low near: 73°. High near: 82°. Winds: Southeast 10-20 mph with gusts to 25 mph. Thursday (5/2): Morning cloudiness becoming partly cloudy, warm, humid and breezy with a 40% coverage of showers and thunderstorms. Low near: 72. High near 84°. Winds: Southeast becoming South 5-15 mph with gusts to 20 mph.